Late bite: A third swarm of midges has been confirmed by experts and suggest climate change could be the reason for the biting beasties’ late show. Summer has ended with a perfect swarm – an unusual third hatch of midges. A leading expert on the biting beastie said a third hatch had been confirmed – and it may become a regular occurrence due to climate change. That will be bad news for the Scottish tourism industry, which had previously estimated to lose about £286 million-a-year because of the voracious and swarming insects. 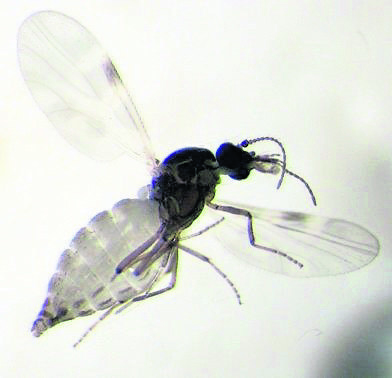 The first hatches of midges were unseasonably late because of the Beast from the East and the second – and usually last – hatch emerged at the end of July into early August. But now a third hatch has been recorded. 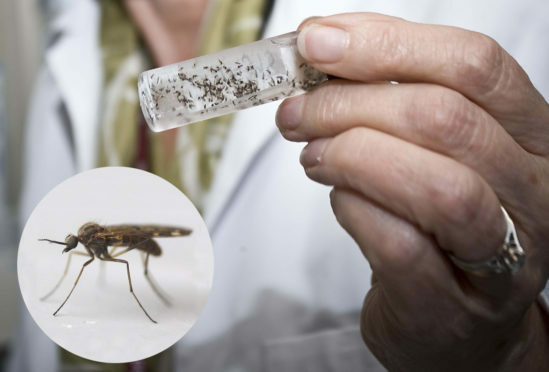 Dr Alison Blackwell, who runs the official Scottish Midge Forecast and is director of Dundee-based APS Biocontrol Ltd – makers of anti-midge repellent Smidge – said: “We are getting lots of reports from all over the Highlands and Islands with healthy numbers being caught in the traps. “I don’t expect them to be around for more than three weeks because the weather is getting cooler. She added: “Midges like it warm and wet – not hot and dry – and that is the kind of weather predicted in the future with climate change. “The numbers fell quickly in the hot spell. They only have a 2mm wingspan so they become dehydrated quickly. Some weeks the numbers being trapped were down by about 50 percent compared to normal years. Dr Blackwell and her team previously estimated there were 139 billion midges in the Highlands and Islands on an annual basis. So the number of midges seeking a “blood meal” over the summer were estimated around 21 billion. Dr Blackwell added: “The male/female ratio is approximately the same with males being concentrated at emergence sites, whereas females fly further to lay eggs and to go hunting for a blood feed. “The first egg batches are laid autogenously – this does not require a blood feed – and there are relatively high levels of mortality throughout the cycle. “So not all females make it to biting point, so to speak. But we think around 21 billion will seek a blood meal during the season. This year there will be a few billion more with a third hatch. Two million midges weigh just a kilo – and one square metre of land will contain about 500,000 of the insects. The flying midge lives for between two days and two weeks depending on weather conditions. During this time the female can lay up to 170 eggs in as much as three batches.